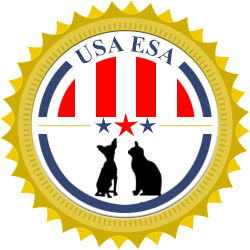 The service we provide to our registrants empowers them to take their animals with them so that their companions can always be by their side, without fear of hassle. Genuine service dogs are well-trained, do not have behavior problems, and assist a disabled person in some way that is crucial to them living their life. That is why the Americans With Disabilities Act grants people with disabilities the ability to bring their service dogs with them to places where pets are not normally allowed. In fact, many people do not realize that the ADA does not require registration documents - verbal assurance that the dog is a service dog is all that is necessary by law for businesses to recognize your service dog and allow the dog onto the premises with you at no additional charge. Unfortunately, many business owners are ignorant of the law and would quickly harass anyone who brings service dogs into their business without "valid" documentation, so our customers do realize that having these documents with them, in addition to vests, tags, and leashes, although not necessary by law, does make their lives much more hassle-free by helping to avoid that confrontation. Business owners have valid reasons for not allowing pets onto the premises, from health concerns at restaurants to noise control at movie theatres and many other similar reasons. If people bring their untrained dogs to their premises and cast them as service dogs, business owners become more and more critical of anyone in the future who attempts to do so, even for people with real disabilities who do have a well trained service dog accompanying them. This unfortunate practice makes their lives all the more difficult. The last thing that somebody with a debilitating disability wants to face is harassment about his or her service dog. People who pass off their pets as service dogs increase the chance that a person with a disability will have to be questioned about whether his service dog is a real service dog, adding difficulty to an already difficult life. Please do not register fake service dogs! If you wouldn't park in a handicapped spot because you don't have a physical disability, we ask that you do not register your pet as a service dog if you don't have a physical or mental disability or if your dog is not well trained. These kinds of registrations create real problems for people with disabilities, problems that they do not need in their lives.